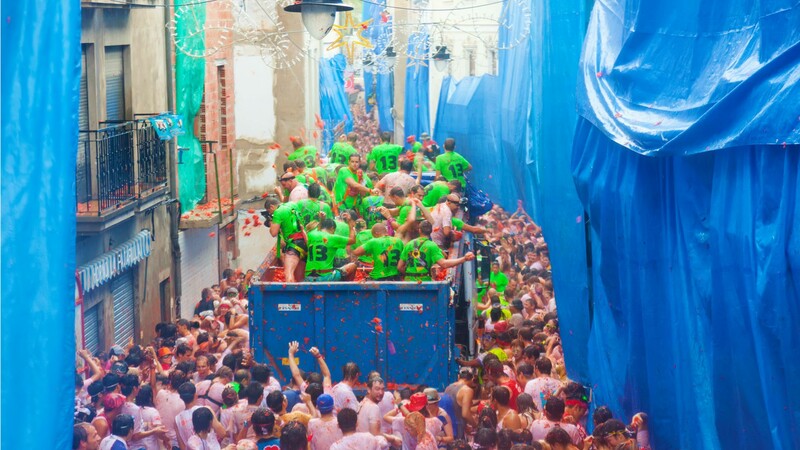 The town will literally be painted red in Buñol, Spain this week in celebration of the annual La Tomatina festival. Over 100 tonnes of tomatoes will soon be trucked into the town of Buñol, located 40 kilometres west of Valencia, for one of the largest food fights in the world. There are many different theories explaining the origins of the festival, which dates back to 1945. Some say a fight between friends over dinner devolved into food throwing, while others say locals tossed tomatoes at an unpopular city councilmen during an event. The festival now celebrates Buñol’s patron site and draws over 20,000 visitors from across the globe. The kick-off for the festival is equally as absurd as the main act, with a ham attached to a greased pole being held up in the air as participants try to climb to the top. Regardless of whether or not anyone nabs the ham, a cannon is fired at 11am signalling the beginning of the tomato throw-down. Tomatoes are tipped from trucks into the crowd below and participants have exactly one hour to toss them at everyone and everything, before the cannon is fired again to mark the end of the action.